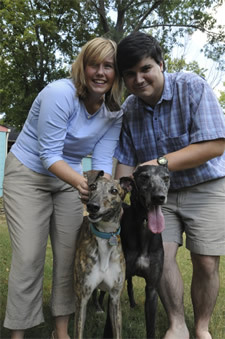 In addition, each adoption includes: A martingale/sighthound collar, lead and muzzle, and a week's supply of food. If a greyhound seems like a good fit with your lifestyle and your future, please print out our PDF Application or email us your snail mail address and we’ll send one. Then mail your completed application along with the required $50 deposit to the address on the application. You also may pick up and turn in your application at one of our Meet and Greets.